Lava coils on patterned volcanic crust in Cerberus Palus, Mars. Giant coils of lava on Mars suggest a mysterious network of valleys on the planet was born from volcanoes, researchers say. The origin of the Athabasca Valles region near the equator of Mars has been debated for more than a decade. Some researchers have proposed that lava once shaped the valleys, while others have thought ice was responsible. 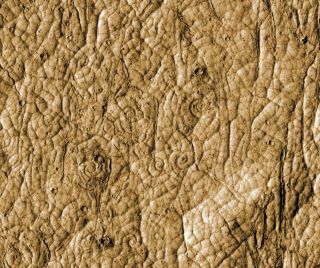 The way the ground there is patterned with multisided polygons suggests that either fire or ice could be the culprit — such patterns of cracks might have formed due to seasonal fluctuations in temperature if the surface there was rich in ice, but also might have arose as lava cooled and fractured. "This is the first time lava coils have been identified on an extraterrestrial setting," study lead author Andrew Ryan at Arizona State University told SPACE.com. "The most surprising thing about these features when I first saw them was how well-preserved they are." Ryan spotted all these coils, ranging from 16 to 98 feet wide (5 to 30 meters), by eye. "You can't see them unless you zoom in really close, and even then they're really subtle — it's pretty dusty there, so the images are just a pale gray color, and they don't really jump out until you boost the contrast, so it's not surprising at all to me that they've been overlooked before," Ryan said. Lava coil (10 meter diameter) on the surface of the 1974 Hawaiian pahoehoe lava flow. These spirals resemble lava coils on Earth, such as those forming on the surface of Hawaiian lava flows. "These can only be explained by lava processes," Ryan said. "There are no known processes to twist ice around on that scale." Future modeling of how these spirals formed can help figure out the composition of these lavas, "which can tell you about the composition of the Martian crust and mantle, things we don't know much about," Ryan said. Mars is the home of the largest known volcano in the solar system, Olympus Mons, which towers over Mars' western hemisphere. At 16 miles (25 km) high, it is about three times as tall as Mount Everest, Earth's highest mountain. The $720 million Mars Reconnaissance Orbiter launched in September 2005. The scientists detailed their findings in the April 27 issue of the journal Science.